DJs Rickie, Melvin and Charlie will take over from Charlie Sloth to host the late evening show on Radio 1, the BBC has confirmed. The trio, who currently present the breakfast show on Kiss, will begin hosting the 9-11pm show in 2019. Sloth left the station last month, just one year after he began hosting the show – which was titled The 8th. In a statement, Rickie, Melvin and Charlie said they were “so excited to be joining the Radio 1 family”. 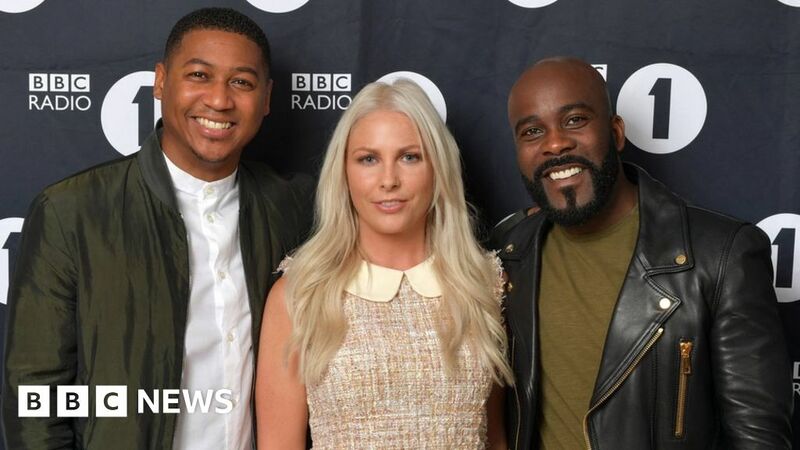 The trio, whose full names are Rickie Haywood Williams, Melvin Odoom and Charlie Hedges, added the new show would be an opportunity for listeners to “hear a new side to us as we get to showcase the music we love”. Andy Roberts, group programme director at Kiss, said the trio “have had a record-breaking 10 years on Kiss Breakfast, claiming the crown as both the biggest breakfast show in London and commercial breakfast show across the UK. The former host of the late evening slot, Charlie Sloth, left Radio 1 under a cloud. It’s highly unusual for a DJ to leave a slot they’ve been in for less than a year – especially when a radio show format has been specifically created and developed for them by the station. But, in October, after just a year presenting The 8th, Sloth announced he’d be leaving to “seek a new challenge”. He was due to continue presenting the show until the beginning of November, but had to leave the station early after a controversy involving Edith Bowman and an awards ceremony. When Bowman beat him in the best specialist music show category at the Audio & Radio Industry Awards (Arias), Sloth attempted his own “Kanye moment”. He took to the stage and, in strong language, suggested that he was a far more relevant presenter, because his mum listens to Edith Bowman. Sloth later apologised publicly to Bowman, and tweeted that the stage invasion was “supposed to be a bit of bants”. The 37-year-old presenter had spent more than a decade hosting various shows on Radio 1 and 1Xtra, and he has not yet announced what his new projects will be. Dev took over presenting The 8th while the station searched for new presenters – a schedule change which was at least partially responsible for a jiggle of Radio 1’s weekend schedule. Radio 1’s poaching of Rickie, Melvin and Charlie back into the BBC stable is significant in the wider radio industry. Ben Cooper, who is the controller of Radio 1, 1Xtra and Asian Network, has previously acknowledged it’s been more difficult in recent years for Radio 1 to develop younger talent. This is a result of there being fewer youth-focused TV shows such as T4, Top of the Pops and CD:UK from which to poach presenters. Instead, the station has more recently focused on hiring voices from student radio, such as current breakfast host Greg James. It was far more common in the 1990s for Radio 1 to poach from commercial radio – Scott Mills and Chris Moyles were both brought over from their respective commercial shows. However, although Rickie and Melvin made their name at Kiss and are considered commercial figures, they actually began their radio careers at BBC 1Xtra more than a decade ago. Work experience led to a contract producing shows, before the pair began presenting weekend breakfast as a double act. Since then, they have kept up a relationship with the BBC, appearing as regular panellists on BBC Three’s Sweat The Small Stuff, fronted by Nick Grimshaw. Melvin was also a contestant in the 2016 series of Strictly Come Dancing – but was voted out first. The pair have presented for ITV2, Channel 4 and MTV, and have previously hosted the Mobo awards. When they joined Kiss, they were put together with Charlie Hedges, who started her music career DJing at international events and festivals such as Ministry of Sound, Global Gathering, V Festival and Space Ibiza. Ben Cooper, controller of Radio 1 & 1Xtra said: “Radio 1 needs to keep disrupting, keep changing, keep surprising our audiences and our industry.